Families of faith will want to introduce their children to the concept of salvation on a level that the kids can understand. It's important to capture a child's interest, or he won't pay attention to the lesson. One way to do this is to utilize a series of activities to keep the children engaged. Kids need to understand that even after they accept Jesus as their Lord and Savior, temptation still exists. They also need to understand that when temptations, or sins, such as envy and anger, come their way, Jesus will give them the strength to "toss" away these sins. For an activity to illustrate this, separate some children into two groups and have them stand on opposite sides of the room. Give each group the same number of crumbled up pieces of paper. Explain that when you say, "Go," they must begin throwing the paper -- which represents their sins -- away to the other side of the room. Of course, each group of children will have "sins" from the other group coming onto their side of the room. Tell them to quickly gather those sins and toss them back again. After one minute, tell the kids to freeze. Count how many sins are in each group. The group with the least amount of sins wins. 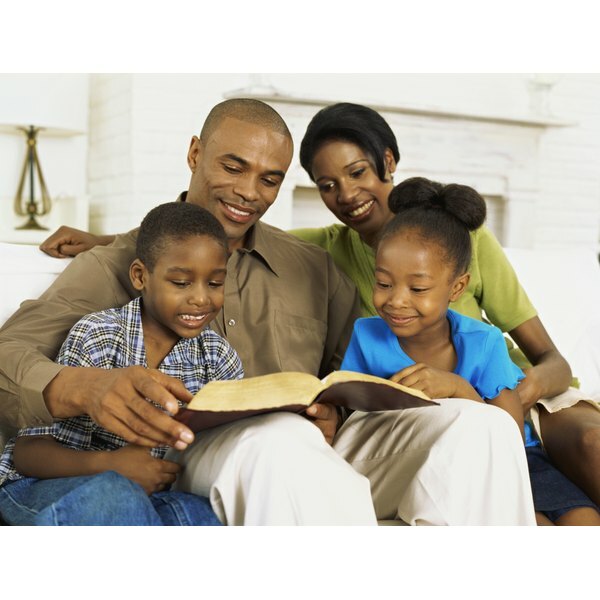 Younger children have an easier time memorizing songs, which makes it a great activity to reinforce a salvation lesson. Perhaps the most popular salvation song written for children is "Jesus Loves Me." The second of the song's four verses is especially helpful in teaching children about the ultimate sacrifice that Christ made. The words, "Jesus loves me! He who died, Heaven's gate to open wide; He will wash away my sin, Let His little child come in," are especially powerful. Even the youngest of children can make a butterfly. Butterflies lend themselves to a discussion on salvation. Just as the caterpillar must die to become a beautiful butterfly, so must we, as children of God, die to start a new life. Use verse 2 from Corinthians 5:17 to go along with this activity. It states, "Therefore, if anyone is in Christ, the new creation has come: The old has gone, the new is here!" Kids can create a butterfly by painting one on a sheet of construction paper. You can then cut it out for them -- and they can glue it to a clothespin. Attach the clothespin to a clothesline or a piece of yarn and it will look like it is flying free. Sometimes it helps if children can visualize the process of salvation. Creating a bulletin board that displays the basic steps of salvation is an activity in which one or many children can participate. Start off with a large white posterboard and draw a railroad track across the center of it. Let the children color above the railroad track in blue for the sky and below the railroad track in green for the grass. Cut out four rectangles to represent cargo cars. Let the children glue them to the railroad track. Use a black marker to add wheels to the cars. Then use the marker to write, "Salvation" across the "sky" right above the train. Next, write, "Believe" in the first rectangle, "Pray" in the second, "Repent" in the third rectangle and "Confess" in the last one. The children can hang the bulletin board up to see the salvation process from beginning to end.